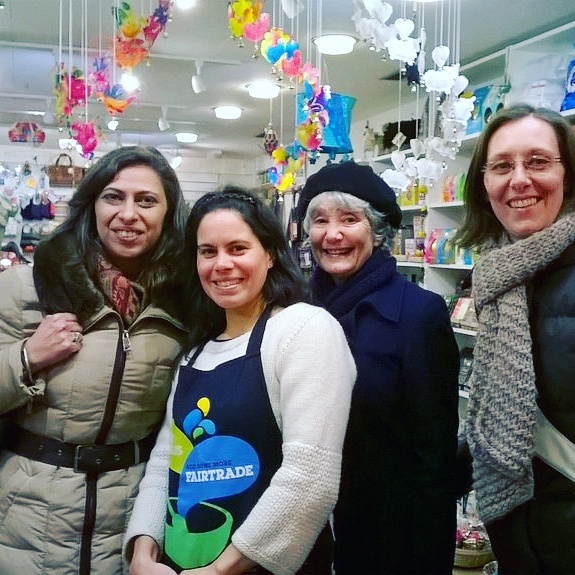 Staff at Fairtrade at St. Michaels were delighted to meet Mona El-Sayed (left), Director of Fair Trade Egypt at their shop during Fairtrade Fortnight. Thank you to Silvia (right) and our friends at RISC for arranging this visit. She was accompanied by Carol Wills (second right) from the Oxford Fairtrade Coalition. Mona spoke about setting up Fair Trade Egypt, and also the role of women since the Arab Spring. Here they are with shop manager, Daniella (centre). This entry was posted on Saturday, March 19th, 2016 at 4:22 pm and is filed under Fairtrade Fortnight, Fairtrade Shop. You can follow any responses to this entry through the RSS 2.0 feed. You can leave a response, or trackback from your own site.